What’s better than a loaf of Cherry Lime Bread? How about two loaves of cherry lime bread? They freeze well and are perfect for sharing, too! I have a confession. I keep a pretty clean house and I’m proud of it. AND I think I’m raising happy kids. Why is this a confession? Well, I am personally tired of seeing the memes and comments that messy house= happy children. It’s okay to also say clean house= happy children. I don’t neglect my kids to keep a clean house. I have just raised them as little children to pick up after themselves. And then, after I have tucked the last child into bed, I spend an extra half hour tidying up. That way, we wake up to a fresh home. Happy mom= Happy children. I feel like there are debates everywhere about working, staying at home, cleaning, breastfeeding. By making a funny picture about your choice, doesn’t mean it’s for everyone. Be confident in how you want to raise your kids, feed your kids, and keep your home. If having a clean house stresses you out…then so be it. But for me, I find comfort in sitting on the couch after a long day, knowing my laundry is done and the dishes are clean. Haha. Don’t use an excuse “well at least my kids are happy” as why your house is messy. Cause you can have both if you really want it. I also may be a little obsessive compulsive about my own messes and junk. I don’t notice it in other people’s houses…but if stuff piles up in my own, it bothers me to no end! Unless it’s dishes. I am an expert dirty dish stacker. I can make them fit into the sink like it’s nobody’s business. If they fit in the sink, then I don’t need to do them right away. It’s when they start piling up on the counters that I feel it’s necessary to do something. And by “do something” I totally mean get my husband involved. But, I pay in treats. 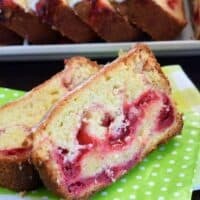 Like this delicious Cherry Lime Bread. I made four loaves of it one day, all in the name of recipe testing! I had to make sure it was perfect. Granted, I made a few dishes that day, but the reward was sweet. Literally. And this bread is so easy to freeze too. I wrap it up in foil then place it inside a large gallon sized ziploc bag. I usually toss them in there with the glaze on. But, if you want it to LOOK pretty when you serve it, then add the glaze fresh after thawing. A frozen glaze thaws in a not so pretty way (it becomes almost clear). So, tell me…do you keep a clean house? I don’t judge, promise! Quick breads are delicious, especially this Cherry Lime Bread with sweet lime glaze. Perfect for freezing too! In a large bowl, beat butter and sugar together. Add eggs, one at a time. Beat in vanilla. Add vlour, baking powder, baking soda, salt and lime zest. Slowly beat in sour cream. Grease two 9inch loaf pans generously. Spoon over half the batter evenly to each pan. Divide pie filling evenly between pans, spooning it over the batter. Top with the remaining bread batter. It's okay if it doesn't cover the cherry filling completely. Bake in a 350 degree oven for 60-70 minutes. Remove and cool on a wire rack for 10 minutes. Then remove from pan and cool completely before adding glaze. For the glaze, whisk the powdered sugar with lime juice until smooth. Pour over tops of bread. In a small bowl, combine the lime zest with granulated sugar until crumbly. Sprinkle over glaze. Allow to set about 15-20 minutes before wrapping. ENJOY. 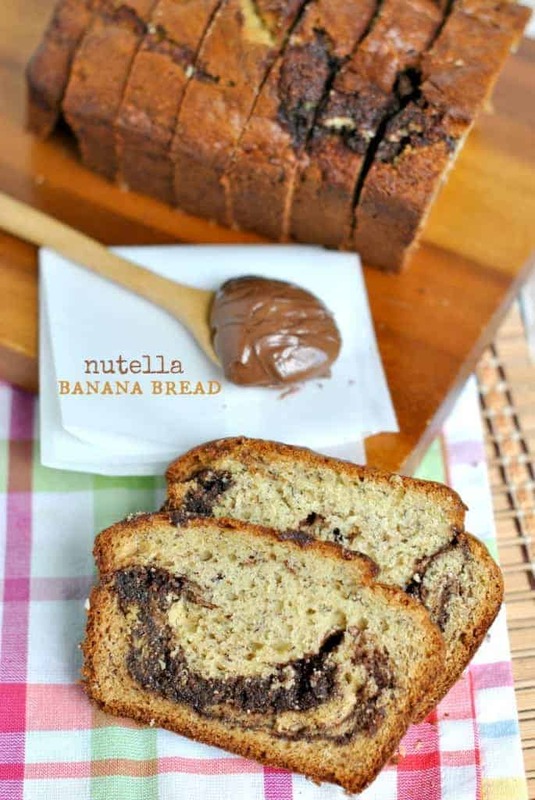 Nutella swirled Banana Bread: such a delicious treat for breakfast or dessert! 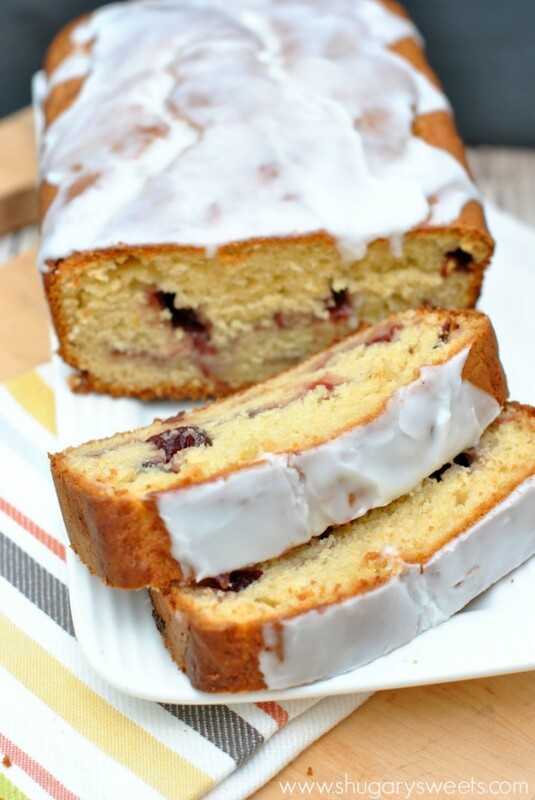 Cranberry Orange Bread: another delicious quick bread with a sweet citrus glaze! 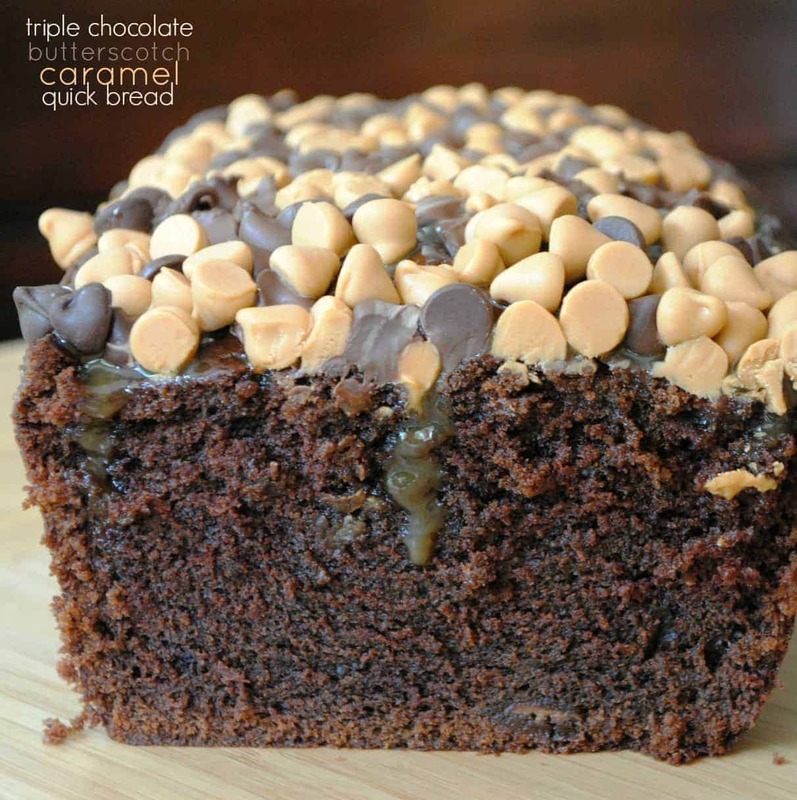 Triple Chocolate, caramel, butterscotch bread. Need I say more??? I have never thought to pair cherry and lime, can’t wait to try this! Sigh, the messy house. My mom just sent my a youtube video of this mom who say “Let It Go” about her messy house. It’s like, okay, I can take a hint. I truly do my best but the kids are such terrors! But I agree, a clean house just makes like easier and plus you can find stuff! Okay, back to cleaning boot camp, you’re convincing me I need to make my kids try harder to pick up. Let’s just say I keep a neat and tidy house. 🙂 I love that this recipe makes 2 loaves — one for me, one for the freezer! My house is FAIRLY TIDY. For me, I think it’s spotless but my husband is a bit of a neat freak. And I know the crumbs from ALL THE SLICES of this bread that I am going to devour are going to freak him out 😉 Pinned! Delicious! I prefer clean living space too, but sometimes I’m too lazy! 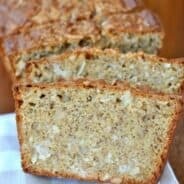 Cherry and lime are so delicious together – Cherry Lime Rickey’s are my FAV – I can bet you money I’d love this bread! Thanks Aimee! Love the cherry lime combination! That cherry swirl looks incredible! Right on, Aimee! We’ve gotta stop tearing each other down. Why can’t people just accept that everyone sees life differently? And I’m quite jealous of your clean house. I try so hard, but my kids keep winning that battle. It’s very frustrating. Love this bread! And that glaze…hello! I’m with you, clean house means happy mom which means happy kids and husband. I can be a bit obsessive compulsive about it though, but I’m working on that part. This bread looks wonderful, I love cherry and lime together. Ugh, the dogs. We call them “tumbleweeds” blowing through our house. The big clumps of dog hair!! I’ll trade you my coconut lime bread for this beauty! I love love that you used pie filling and my favorite at that! Pinning! What a fun flavor for bread! Oh yes, I love a clean house. I don’t keep it as clean as I used too though. At my age it takes lots of energy to do. I can’t leave home unless our bed is made. Dishes are washed or put in the dishwasher as I cook. No way I could come home to a bunch of dirty dishes. If we could control the mail piling up that would be a plus. HA!!! I agree a messy house does not mean kids are happy. Believe me, I worked almost 25 years in the school system and you can tell pretty much what kind of a atmosphere they are raised in. It is so beautiful! Lime and cherries actually sounds so amazing! My mom used to give me an allowance every week to vacuum and dust the house. It taught me discipline and provided me the funds to go out and by the newest “Now, that’s what I call music” CD. Although I don’t have children, I do have two pups in the house with dirty paws. I like to keep a clean house. It makes me feel better and freshens up the living space. 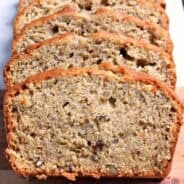 This bread…YUM! 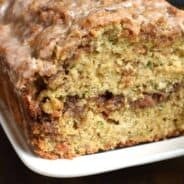 I’ve never had cherry lime bread, but it looks like a delicious snack. Yeah, sometimes I think my dog is dirtier than my 4 kids, LOL!!! Girl, yes. My house is always clean and we always do a pick up after the kids go to bed. I can’t relax in a mess!! This bread is just what I need at the end of the day 🙂 With a clean house. And tea. I would totally do your dishes if this Cherry Lime Bread was the reward. Looks incredible. Love that swirl! I’ll be making a mess today…come on over! I am unorganized, so I tend to have bill piles and laundry baskets filled with folded clothes in every corner. But I can’t stand dirtiness. I clean all day long. I also play and work all day long, you can certainly have happy kids in a clean house. To say you can’t is kind of absurd. I think happy kids stem from a happy family…. dirty or clean house who cares right?! Parenting debates always drive me insane! This bread though, I have no issues with. It looks amazing Aimee! I have a clean house and no kids and ive always worried that when I have kids it would turn into one big mess. Nice to know it is possible to maintain a clean and tidy house! 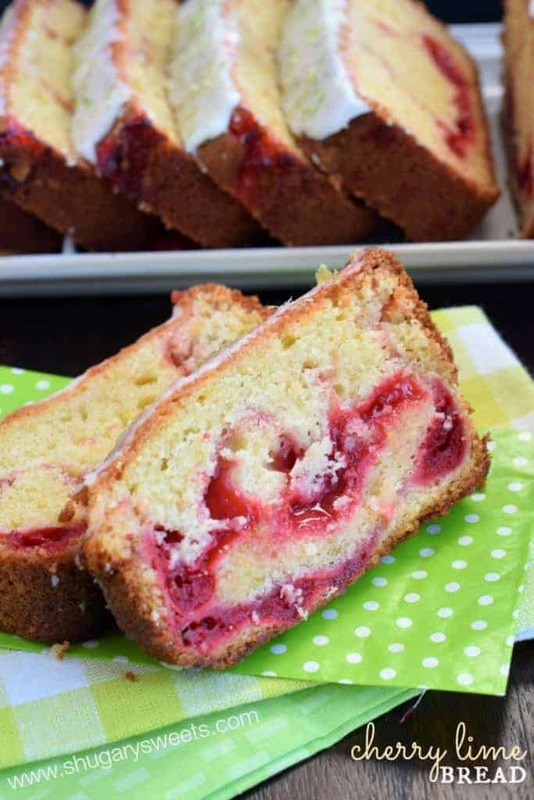 Meanwhile loving this gorgeous cherry lime bread! 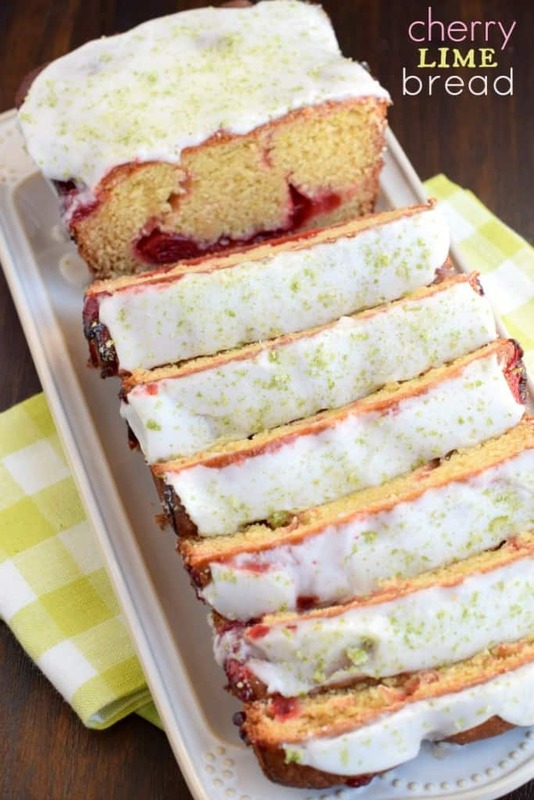 Love this recipe, the combo of the lime and cherries – perfect! For the most part I can’t go to bed if there is a big mess in the kitchen or living room, so I always do that quick 10 minute clean up. It just seems so much better to start the day off with everything picked up. Clean house, happy mom, and happy kids…sounds like a plan to me. And this bread…that cherry swirl is killing me!!! I wish I had a big giant piece to enjoy with my coffee before I dirty up the kitchen again! Do you think this would work with lemon instead of lime? I would love to make it but I am more of a lemon lover than lime. Or even orange zest instead? Any thoughts?